Lush green valleys and rugged mountains, sheer cliffs and wild, frothing, slate-grey seas. Bagpipes, baroque cathedrals and the smell of grilled seafood. The architectural grace of Santiago de Compostela and the industrial churn of Vigo. Galicia, the north-west corner of Spain, is a diverse region, but amid the variety there are two constants: first, it’s one of the best places to eat seafood in the world; and, second, its wild landscape, seemingly more Scottish than Spanish, is the most beautiful on the Iberian peninsula. Galicia is also large, about three-quarters the size of the Netherlands, and so for this guide we’ll travel along its coast, picking out some of the best beaches, coastal towns and seafood restaurants from Ribadeo and Ortigueira in the north via A Coruña and the Costa da Morte and then south to the area known as the Rías Baixas. Although Galicia is good to visit all year round, the best time to go is from June to September. However, even during the hottest months of the year, be prepared for rain, which can be heavy and, at times, persistent. Praia das Catedrais, Ribadeo. In Galician, Praia das Catedrais means “beach of the cathedrals” and, as you walk along this beach and through the arches and craggy domes sculpted into the rocks by wind and sea, it is easy to see why. When the tide is low, and the weather holds, it’s possible to spend hours exploring the sea caves. In summer (1 July to 30 September) and Easter week, numbers are controlled and it’s vital to book a visit to the beach (free) at ascatedrais.xunta.gal. Barqueiro and Estaca de Bares. Barqueiro, a small, tranquil fishing village of multicoloured houses, is the perfect place to pass the afternoon staring out at the bay while sipping a nice glass of albariño, Galicia’s most famous grape varietal. From here it’s only a 15-minute drive north to Estaca de Bares, the most northerly point of the Iberian peninsula. Its 19th-century lighthouse is a quiet place from which to appreciate the uninterrupted views of the Bay of Biscay and the relentless ferocity of the Atlantic. Viveiro. Set amid rolling hills covered with pines and eucalyptus trees, Viveiro is on the estuary of the river Landro. It is a picturesque place, with walls that have withstood pirate attacks and plagues, and springs that have attracted countless Santiago pilgrims. Wander through its idyllic squares, its grand entrance gates and over its medieval bridges. Covas beach is also only a short walk from the town centre. Praia de Xilloi, O Vicedo. Replete with dunes, imposing cliffs, and fine white sand, this kilometre-long beach is one of the best in Lugo province. The turquoise waters, although brisk, are not too dissimilar to the Caribbean. The beach has parking, showers and restaurants nearby and is a good place for families. Praia de Carnota. 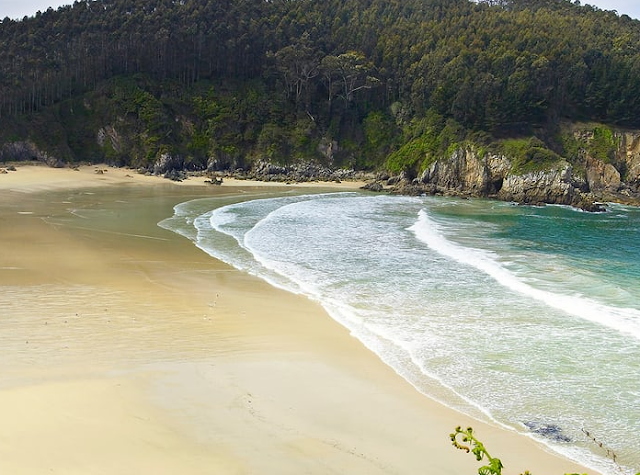 Some 7km long, this beach is considered the longest in Galicia. Far from any urban area, with rolling dunes, white sand and framed by the majestic Mount Pindo, it is a spectacular place to pass a few hours. Be warned, however, the tidal currents are strong and, with no lifeguards present, it’s not ideal for children. The beach is accessible by car, but lacks amenities like showers and changing rooms. Praia de Laxe, Costa da Morte. Sheltered from the Atlantic by the estuary of the river Anllóns, this beach has calm, clean waters and white sand, and is almost 2km long. And being in the centre of the town of Laxe, it offers more services than most of Galicia’s more rural beaches. There’s parking, lifeguards, showers and disabled access to the beach. There is also a host of bars and restaurants along the promenade, including Marisquería Zurich, one of the best seafood restaurants in the area. Cabo Finisterre. For centuries, this rugged outcrop was considered the most westerly point in Europe (though Cabo da Roca in Portugal is actually 10 miles further west) and, until medieval times, the End of the World. The last stop before the beginning of the Mare Tenebrosum, the cape is submerged in legend – tumble down the rocks, visit the lighthouse, and it feels like standing on the precipice of the world. Isla de Ons. Weekly travel inspiration every Wednesday afternoon. Off-piste attractions, budget breaks, top 10s and reader reviews. Uncover unconventional destinations and rediscover old favourites - let our travel editors guide you to trips worth taking. Rúa das Ostras, Vigo. Oysters have been famous in the city of Vigo for hundreds of years. Farmed on the estuary in the nearby town of Arcade, they come in fresh every morning to the oyster shops of Rúa das Ostras (the street of the oysters). From 9am to 3pm, the many street stalls sell the shellfish for between €12 and €18 a dozen. Combarro. On the Pontevedra estuary, this village is perhaps one of the most beautiful on the Galician coast. After the rustic stone houses that line the seafront, the biggest attraction here is the hórreos, traditional granaries built in wood or stone and raised on pillars. There are 30 of these unique constructions dotted along the promenade and throughout the town.